IRVINE, CA--(Marketwired - Jul 11, 2016) - AIDS Services Foundation Orange County (ASF) -- a nonprofit AIDS service organization that has helped more than 8,000 people living with HIV and AIDS in Orange County since 1985 -- is pleased to announce the addition of its new CFO, Guita Sharifi, Ph.D. (ABD) to its headquarters in Irvine, Calif. As CFO, Sharifi consults with ASF CEO and executive director, Philip Yaeger, to meet the vision and strategic goals of the organization by providing financial transparency, cost savings and improving efficiency through financial and operational oversight. "With more than 15 years of experience in the nonprofit healthcare sector, Guita is a welcome addition to our team," says Yaeger. "She will be instrumental in the advancement of our organization and its client programs. We look forward to drawing from her expertise." ASF selected Sharifi for her industry experience, which has equipped her with extensive knowledge in navigating major changes in the nonprofit healthcare sector. Sharifi's vast financial background and alignment with the ASF vision set her apart from other candidates. Sharifi will focus her expertise on diversifying funding, improving efficiency in revenue cycles, budgeting and supervising the financial department. "It's an honor to join ASF's team of forward-thinking professionals," says Sharifi. "I feel privileged to be part of a team with exclusive focus on ending the AIDS/HIV epidemic in Orange County. ASF's collaborative efforts put the client first, while providing immense value to the community." 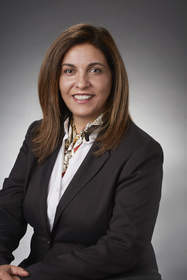 Prior to joining ASF, Sharifi served as the chief operations and financial officer for Rose Garden Holistic Care and consulted with Acacia Adult Day Services where she worked with principal owners to setup systems, licensures, policies and procedures and developed financial projections. She is a licensed IRS Enrolled Agent (EA); she earned a bachelor's degree from Eastern Michigan University; is working towards a Ph.D. in organizational leadership from the Chicago School of Professional Psychology; and also received her presidents and key executives (PKE) MBA from Pepperdine University, which brings immense value to the team of ASF experts. AIDS Services Foundation Orange County (ASF) is a nonprofit AIDS service organization that has helped more than 8,000 people living with HIV disease in Orange County since 1985. ASF serves the local community impacted by HIV and AIDS by providing food, transportation, housing, emergency financial assistance, counseling, education and preventative services. Learn more about the organization by visiting www.ocasf.org. To stay in the loop, follow ASF on Facebook, Twitter, Instagram and LinkedIn. Donate directly to the organization's important efforts here.